Installing and configuring Forefront Threat Management Gateway (TMG) 2010 can be a tedious and time consuming process. Add to that the time it takes to install service packs and updates after the installation is complete, a systems administrator or network engineer can invest a significant amount of time bringing a TMG firewall online. In addition, a manual installation and configuration process tends to be error prone, often resulting in integration issues due to mismatches in service pack or update levels. We can address some of these challenges using techniques such as service pack and update slipstreaming and unattended installation. As an extension of this, but outside the scope of this article, is the use of systems management software like Microsoft System Center Configuration Manager (SCCM) to perform an automated deployment of the TMG software. This could even include the bare-metal deployment of the underlying operating system as well. As you’ll see here, with some planning and preparation the Forefront TMG 2010 firewall can support the rapid, automated provisioning requirements of today’s modern datacenters. Once complete, you can copy the updated TMG installation source to a shared folder on a file server, create a virtual hard disk drive, or create an ISO file using your favorite utility. To complete an unattended setup for Forefront TMG itself, an unattended answer file is required. You’ll find sample files located in the \FPC\Unattended_Setup_Sample folder on the installation media for Standalone, EMS, and Remote Management installations. You’ll even find a sample file for an unattended uninstall. Since we’re preparing a standalone TMG firewall, copy InstallStandaloneServer.ini to another location, then right-click the file and choose Edit. 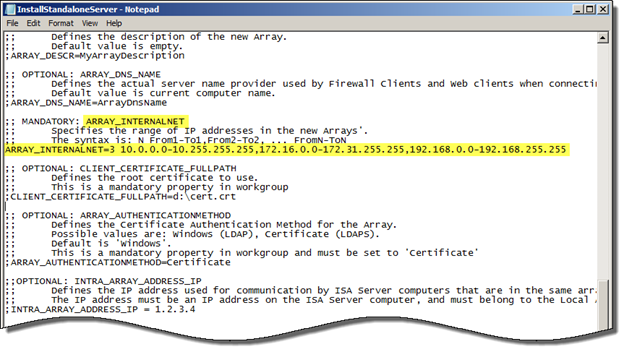 Type Ctrl-F and search for the parameter ARRAY_INTERNALNET. By default, the answer file already includes the RFC1918 private IPv4 address blocks, which may be fine in some instances. After you’ve finished editing and saved the unattended installation answer file, you can use the following command to execute a full unattended installation. One challenge you’ll find is that after installation begins there is no clear visual indicator that the setup process has completed. To determine if the installation completed successfully, navigate to the C:\Windows\Temp folder and look for a file called ISAWRAP*.log. Open this file and scroll to the end. If the setup completed successfully the last entry should show a return value of SETUP_SUCCESS. Now, if you’re really clever you can copy tail.exe from the old Windows Server 2003 Resource Kit utilities and tail the file after the installation starts. You can also use your existing systems management tools to monitor this file for successful completion. Once the automated installation has been completed you can manage your Forefront TMG firewall as you would normally. Opening the management console the first time will initiate the out-of-box experience and begin the Getting Started Wizard. Don’t forget that if you are planning to import the configuration from ISA Server 2006, you’ll need to do that prior to running the Getting Started Wizard. Investing time and effort into preparing the Forefront TMG installation media by slipstreaming service packs and updates can be a significant time saver when installing Forefront TMG. It also provides a more consistent installation experience, eliminating the pitfalls of installing TMG in enterprise arrays with different service pack or update levels. In addition, using the unattended installation features of Forefront TMG allows administrators to leverage existing systems management tools to perform fully automated deployments to rapidly provision and deploy Forefront TMG firewalls to meet the demands of dynamically changing environments.